Icare3D Blog: Unreal Engine 4 : real-time GI using voxel cone-tracing ! Unreal Engine 4 : real-time GI using voxel cone-tracing ! 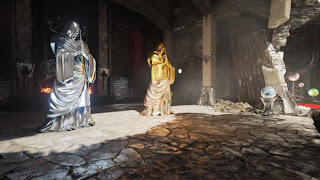 EPIC games just released two impressive videos presenting their new UE4 game engine featuring real-time global illumination that supports diffuse and specular bounces on dynamic scenes. That's really awesome to see research results being used so quickly in a game engine ! Beyond the paper, you can find more details about our voxel cone-tracing approach in my GTC 2012 talk, my Siggraph talk, as well as in my Ph.D thesis on GigaVoxels. 6 Comments for "Unreal Engine 4 : real-time GI using voxel cone-tracing !" Looks like they've borrowed your idea of doing cone tracing in a sparse voxel octree (http://www.geforce.com/whats-new/articles/stunning-videos-show-unreal-engine-4s-next-gen-gtx-680-powered-real-time-graphics/). Congratulations! Congratulation Cyril, it is really awesome work you have done!! So will Epic be paying you royalties? The link http://research.nvidia.com/publication/interactive-indirect-illumination-using-voxel-cone-tracing is broken. Nvidia has shut down the entire publications page. Please post it somewhere accessible. Why cones? Naturally one thinks of square pyramids because of the shape of the pixels. What advantages do cones have?